Eloïse has been asking for guitar lessons on and off for the last year. We finally arranged them and she began last week. She was painfully shy at the first lesson, sticking her fingers in her mouth and clinging to us, not speaking, etc. It bordered on embarrassing. But the teacher had been forewarned and he was really great with her. She actually participated for the second half of the lesson and was very keen to return. Ian took her to the Spanish guitar shop this morning and bought her a beautiful little guitar that is just her size. Then she had her second lesson this afternoon. This one was much better. She still didn’t utter a word but her hands weren’t in her mouth and she sat on her own. She did everything he taught her and, to my eye, did it quite well. By the end of the 30-minute lesson he had begun teaching her to read music. I’ll be eager to see how her enthusiasm holds up to the test of time. This entry was posted in Children, Life. Bookmark the permalink. I love this! Where does she go? That photo is so precious, I had to revisit it! You are one super fab mom! 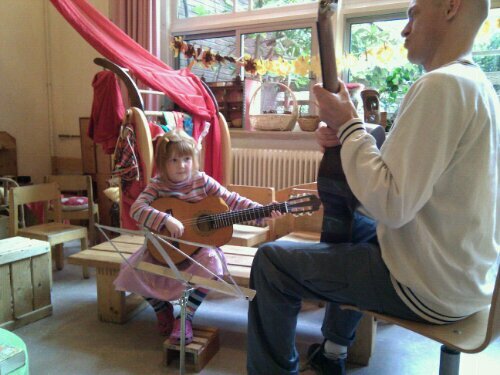 She’s doing the lessons through the Vrijemuziekschool. This guy (and presumably the other teachers) teaches one day per week at her school after school hours and he also does lessons up on the Singel two days per week. I think they have lessons available for violin and piano and maybe other instruments, too. I’ve never felt so proud. She’s another Polly Paulusma in the making. Or Laura Marling.